When Shelly asked me to be a part of the tour for her new collection, I jumped at the chance. I was drawn to the stellar tunic, because it looked fun to sew (and because my daughter needed short sleeved tops). I have to say, the best part of sewing this shirt was picking out the fabric. I don’t quilt much (or well) so I forget how fun it is to go through my scrap bin mixing and matching different bits of fabric. You get to reminisce about the projects you made and put all kinds of crazy patterns together. I love it. But you have to walk a fine line between modern patchwork chic and that crazy patchwork hippie phase I went through in highschool. This tunic is squarely on the modern side of things. My daughter loved that it had bits of fabric from her old shirts and her old sheets even! Actually the very first dress I ever made for my daughter had a bit of patchwork in it. I was so nervous making that dress. The pattern was old and weird and slightly confusing. The pattern for the Stellar Tunic on the other hand, was simple and easy to follow. The shirt came together in a snap! The only fussy bit was attaching the patchwork sleeves to the knit part of the shirt, but Shelly holds your hand the whole way. Usually Figgy’s patterns run exactly to size. This one I found to be just a little big, which is great. This tunic will be perfect for summertime, because it will be summer someday, right? High temperatures will someday be above zero, right? Until then we’re stuck with winter. 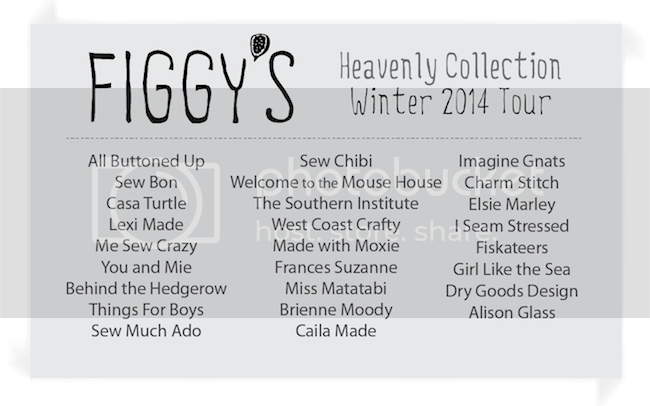 Make your time inside enjoyable by checking out what everyone has made from the Heavenly Collection. There are some real gems in there like Cherie’s pretty dress and Brienne’s cozy sweater. * I was given a copy of this pattern for the tour, but my opinions are as always my own. I’m in love!! Really well done, great fabric choices and its so nice to see a Stellar on the tour!! Thank you! That is awesome! Your daughter is so lucky! How did you finish the pieced seams on the inside if the patchwork? Are they serged and top stitched? yup exactly, serged and then top stitched. Aw shucks, Meg. You are too good to me. Love it! So fresh and modern. I love the woven and knit mix too. I’m always scared to do that! You make the pattern look great here! gorgeous top, love the fabrics you chose and I can see what fun it would be to do. I love this top! she looks so comfy in it. Now it just needs to warm up so she can wear it! So cute! I’ve never tried her patterns. Just the circle skirt. This one looks great!